LaLaLarambla i Barcelona, Spanien : Boka nu! Hence its name sake Lalalarambla is situated only 20 metres from Barcelona's most famous street La Ramblas. We are traveler's just like you so we know what you want and a more than happy to help you out with anything you need. 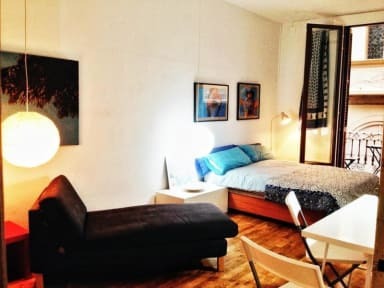 Located in the heart of Barcelona's Ciudat vella area Ramblas Bird House is situated close enough to the action to partake in the amazing Barcelona night life, while still being just far enough away to enjoy a quiet and comfortable night in. We are not your typical hostel, our vibe is extremely relaxed and we consider us and our guest's one big happy family, more like a home away from home. We have a common area for you and your fellow traveler's to eat and enjoy yourself! We have Free Wifi and a self catering kitchen where you can prepare yourself a meal. 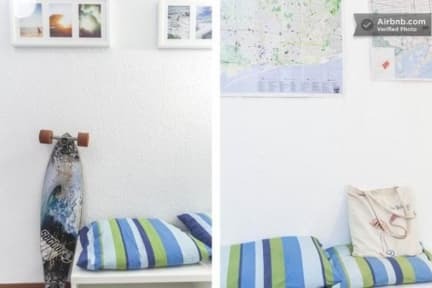 Because of our superior location anything that you may want or need is only a short walk away supermarket, bars, clubs and restaurants are within minutes and the famous beach of Barceloneta is only a short 10 minute walk away.